Salt pork is similar to bacon, but unlike bacon it is not smoked or cured, and is generally saltier. It ranges in cut from lean to entirely fatty, and has been used in American cuisines to add flavor to a variety of dishes including baked beans or boiled vegetables such as string or green beans. Salt pork looks like uncut slab bacon, and can be completely white (entirely fatty) or have a more marbled appearance (depending on the amount of leaner pork in the cut). Colors: White or white with pinkish marbling. Mouthfeel: Consistent with fat trimmings. Choosing: Look for cuts that are uniform in color, and free of any odor that would indicate it has become rancid. Buying: Salt pork is available year-round at most butcher shops or the meat department of your local grocery store. It may be more readily available in Southern states or in areas that favor southern cuisine. Salt pork is often confused with pork backfat. 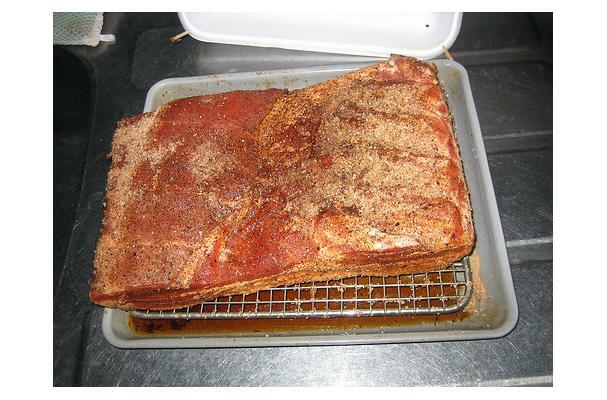 While both come from the same area of the hog, salt pork is preserved with salt, while backfat is eaten fresh. In days gone by, salt pork was a common ingredient in many meals, since most families kept a hog or two and salt preserving was one of the few ways to keep the meat from spoiling. Cut backfat strips into manageable chunks. Set aside. Pour 1 lb. of the salt into the bottom of the crock and smooth it to cover. Lay the backfat chunks on the salt. Lay the platter or other flat object over the meat. Add the weight on top to hold the platter in place. Dissolve the remaining salt in 5 gallons of water. Pour over the contents of the crock. Make sure you have enough water to completely cover the backfat and platter. If more is needed, add up to two more gallons of water. Cover and place in cool place, or the bottom of the refrigerator, for two weeks or longer. If extended storage is needed, remove from brine and freeze. This is only one way to make salt pork. Many old timers did nothing more than pack the fatback in salt and store it in a wooden barrel in the barn until needed for use. Salt pork is excellent in cooked green beans and most Southern-style greens recipes. Fatback is generally used in commercial and home cooked pork and beans. Check daily to make sure that the salt pork is remaining beneath the brine level and is not exposed to air. Salt pork is cut into small chunks or cubes and added in general in the beginning of a cooking cycle, such as adding cubes to a large pot of boiling green beans or collard greens. Cleaning: As with all pork products, salt pork should be rinsed and patted dry prior to cooking. Salt pork can be stored in the refridgerator up to a month at a time. Be sure to keep it tightly wrapped to avoid mold. History: Salt pork was used as shipboard rations for hundreds of years, as well as standard rations (along with hard tack) during the Civil War and the expansion to western U.S. states. All the write-ups are totally helpful and having great styles. I love to see your blog post website on a regular basis it's really enhance my proficiency. Thanks for the remarkable post.